Metformin by controlling blood glucose level decreases the risk of diabetic complications. Metformin, because of its chemical structure, does not interact with the liver and has a short half-life. Consequently, lactic acidosis, which is a rare complication of metformin, has not been associated with the proper use of this drug. Metformin has remarkable advantages. Metformin reduces basal and postprandial hyperglycemia by about 25% in ≥90% of the patients when either given alone or coadministered with other therapies including insulin. Metformin also gives protection against chronic vascular complications of T2DM. Metformin is only taken through oral route with available different doses and formulations such as conventional release, sustained release (SR), and extended release (XR). Metformin is widely prescribed drug all over the world. Developing India has seen epidemic proportion of T2DM population during recent times. Major international guidelines advocate the use of metformin as the first-line therapy over the other oral hypoglycemic agents (OHAs) like SUs. Metformin therapy is as cost-effective as SUs monotherapy and hence ideal for a developing country like India. This study is particularly done to analyze the drug utilization pattern of metformin and its fixed-dose combination (FDC) at tertiary care teaching hospital affiliated to health university. Different types of brands and formulations are available in India. The preference of prescribing generic form or brand of metformin and also usage of monotherapy or FDC therapy depends on treating physician. Such a pattern of preference can be scrutinized by this study. A prospective, observational study was conducted with inclusion of 100 patients. The data collection for this prospective observational study was carried out with intensive monitoring for a period of 6 months in medicine department of tertiary care teaching hospital. All patients who admitted in medicine ward or were referred to the medicine outpatient department (OPD), with confirmed diagnosis of T2DM and receiving metformin from the past 3 months. The patients who fulfilled the above criteria were included in the study irrespective of age and gender. Complete patient demographic details, laboratory data, and drug therapy administered were obtained from the patients' case files and through patient counseling if needed. The obtained data were recorded in patient information sheet. The random blood sugar (RBS) was measured for all included patients. Details regarding metformin and other OHAs such as brand name, dose, duration, frequency and the route of administration, type of dosage form used, and side effects of metformin were also recorded. After the completion of data collection, questions were asked to the patients as per Morisky 8 Scale for determination of medication adherence. All the quantitative data were expressed as mean ± standard deviation. Finally, the statistical tests such as Chi-square test and P value were applied and the results were drawn. In this study, we noticed that number of patients hospitalized were more (62%) compared to patients visited OPD (38%). Comparing the gender distribution; number of male patients was more (63%) in comparison with female patients (37%). In our study, the age of patients was within a range of 30 years to 81 years with the mean age of male and female patients was 54.88 ± 11.11 years and 54.93 ± 10.92 years, respectively. The majority of the patients receiving metformin therapy belonged to the age group of 51–60 years (33%). There was a high degree of variability (from 3 months to 23 years) found in total duration of suffering from T2DM among the included patients. The total number of comorbidities observed in this study was 122. The most frequent comorbidities observed in the study population were related to cardiovascular system (CVS) 64.75% (n = 79), followed by endocrine system comorbidities 13.1% (n = 16) and respiratory system comorbidities 4.92% (n = 6). In the study, we calculated body mass index (BMI) of all included patients. The mean BMI was found to be 26.38 ± 5.87 kg/m2. We have classified patients according to their BMI in four categories as per the revised consensus guidelines for Asian Indians and World Health Organization criteria. As per that 48% of patients belonged to obese category (≥25 BMI). In our study, RBS was noted for each patient. The mean value for RBS and Hemoglobin A1C (HbA1C) were found to be 234.16% mg (range: 99% mg to 527% mg) and 8.61% (range: 4.7% to 13%), respectively. Before the initiation of our study, we have noted down a list of total 198 brand names in India that are currently available from Monthly Index of Medical Specialties and Current Index of Medical Specialties. In our study, we have observed prescribing of 38 different brands of fixed-dose metformin. In our study, the metformin was prescribed as monotherapy in 15 patients and as a part of combinational therapy with other OHAs in 85 patients. Comparison of these two patterns of prescription was found to be statistically significant (P < 0.05). Out of 120 fixed dose of metformin prescribed in this study, plain formulation was used 39.17% (n = 47) times, SR formulation was used 30.83% (n = 37) times, and XR formulation was used 30.00% (n = 36) times [Figure 1]. For monotherapy, XR formulation was mostly used with 40% (n = 6), followed by SR 33.33% (n = 5) and plain 26.67% (n = 4). Comparison between the frequencies of usage of different metformin formulations was not found to be statistically significant (P > 0.05). In our study, we also did an analysis of medication adherence with the help of Morisky et al. 8 scale. As per the Morisky 8 scale, we have categorized all patients into three categories according to their Morisky points. In that, low adherence was found in most of the patients (49%), followed by medium adherence in 29% patients and high adherence in 22% patients. The difference was found to be statistically significant (P < 0.05). In 100 patients, 120 FDC were used in different formulations and combinations or as a sol agent. 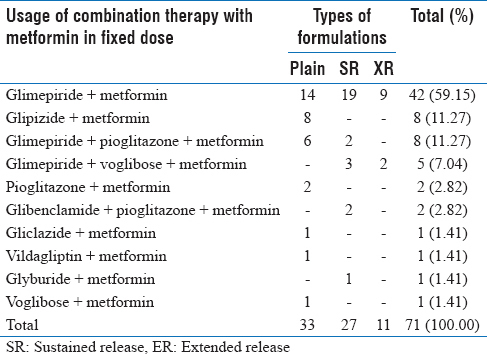 As shown in [Table 1], among FDC therapy of metformin, dual-drug combinations prescribed were seven and triple-drug combinations were three. Glimepiride + metformin was prescribed highest by 59.5% (n = 42) and in that prescription of plain formulation, SR, and XR were 14, 19, and 9, respectively. In this study, we have observed some side effects (n = 18) which were attributed to the use of metformin. Those were mainly nausea, vomiting, diarrhea, abdominal discomfort, abdominal pain, and metallic taste. Most of the side effects were observed with plain formulations (n = 9) and the least were observed with XR formulations (n = 4). Among the different antidiabetic agents used with metformin in the study population, SUs were most commonly prescribed with metformin in combination therapy (46.63%), followed by insulin (29.45%), thiazolidinediones (7.98%), alpha-glucosidase inhibitors (7.36%), dipeptidyl peptidase-4 (DPP-4) inhibitors (7.36%), meglitinides (0.61%), and gliflozin (0.61%). In this study, the highest adherence with metformin therapy was found in patients receiving SR formulations compared to those receiving plain or XR formulations [Table 3]. In this study, the daily dose of metformin prescribed in majority of the patients (48%) was 1000 mg/day. The rest of the patients have been prescribed with a daily dose of 500 mg/1350 mg/1500 mg/2000 mg or 2500 mg. In none of the patients, the maximum daily dose limit of metformin has been exceeded. In the cost analysis, range of the cost of 38 different brands of fixed-dose metformin was found between 0.71 rupees/tablet and 28.94 rupees/tablet and the mean cost was found to be 4.97 rupees/tablet. T2DM is a chronic health problem. Thus, many of the patients who visited OPD or admitted in IPD were suffering from T2DM since long back. The mean age of all the included patients in our study (54.93 ± 10.93 years) and in the study conducted by Patel et al. (56.8 ± 10.5 years) was quite similar. We have categorized all the patients into four age groups. The majority of the patients (63%) receiving metformin therapy were older adults (51–60 years) or elderly (>60 years). The major two problems recognized in elderly diabetic patients are decreased utilization of glucose and overweight which can be resolved by the action of metformin on glucose disposal. We have identified and differentiated each of the comorbidities observed in the study population and while doing that analysis, CVS comorbidities were found to be the most common in 79 patients (64.75%) and among those 50% of patients were having hypertension as comorbid condition. Diabetes mellitus and hypertension are common diseases that coexist at a greater frequency compared with the occurrence of individual one. Hypertension in the diabetic individual markedly increases the risk and accelerates the course of cardiac disease, peripheral vascular disease, stroke, retinopathy, and nephropathy. Quite similar type of the comorbid pattern has been observed in our study as well in study conducted by Teja In both of the study, almost 50% of the patients had hypertension as a comorbid condition along with T2DM. To achieve desired glycemic control and to overcome insulin resistance in patients with T2DM, a monotherapy of any of the OHAs is not sufficient in most of the cases. Same applies to metformin and thus metformin is quite frequently prescribed in combination rather than a monotherapy. Similarly, in our study, most of the patients (85%) were receiving metformin and very few (15%) were on monotherapy. Different types of metformin formulations are utilized as per specific desired glycemic goal to be achieved. One of the major objectives of our study was to identify and analyze the usage of different metformin formulations. Out of 120 fixed dose of metformin prescribed, plain formulations were most common (39.17%), followed by SR formulations (30.83%) and XR formulations (30%). The percentage of utilization of different type of metformin formulations was found to be almost equal. As per a routine clinical practice, the maximum daily dose of metformin is 2500 mg or 2550 mg (when 850 mg used thrice in a day). 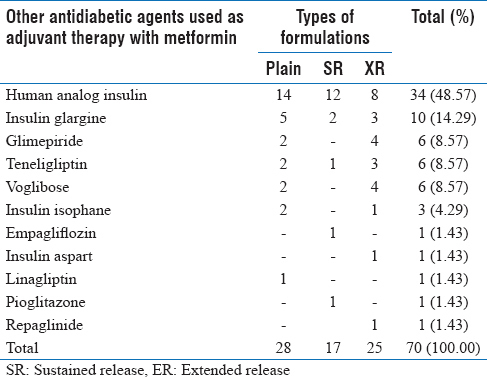 Among FDCs of metformin available, we have observed the usage of seven particular dual-drug combinations in our hospital setting. As per the American Diabetes Association (ADA), if monotherapy of metformin gets failed to achieve glycemic control, then metformin is used in combination withSUs. Also in our study, most of the patients (59%) were receiving dual combinations of metformin with SUsin form of glimepiride. The similar kind of prescription pattern having a predominance of metformin + glimepiride combinational therapy was also observed in studies conducted by Patel et al., Brahmbhatt et al., and Sultana et al. In the category of three-drug combination, glimepiride + pioglitazone + metformin was most commonly used as per our study result which is consistent with the study results obtained by Sultana et al. and Teja. As per the ADA guidelines, the patients in which HbA1c is ≥13, metformin + insulin is used as a combination therapy. In our study, insulin was used in 29.45% of the cases as a combinational therapy with metformin. The OHAs combined with metformin were SUs (46.63%), thiazolidinediones (7.98%), alpha-glucosidase inhibitors (7.36%), DPP-4 inhibitors (7.36%), meglitinides (0.61%), and gliflozin (0.61%). Adherence to medical regimen continues to rank as a major clinical problem in management of patients with essential hypertension, T2DM, as in other condition treated with drug and lifestyle modification. In this study, by following the Morisky 8 scale, most of the patients (49%) were identified with low medication adherence. From this, we may conclude that, very few patients were receiving the medications properly and regularly while in the rest of the patients, the administration of medications was irregular and/or improper. Better medication adherence was observed for OHAs in other studies (49% in Sultana et al. and 40% in Teja). In our study, some of the prescriptions are having metformin monotherapy and rest of the prescriptions are having predominance of metformin as one of the OHAs. Considering this, whatever result, we have obtained regarding medication adherence can be correlated to the medication adherence with metformin. As the medication adherence with metformin is significantly low compared to overall medication adherence with OHAs, we may conclude that metformin might be one of the OHAs with very poor medication adherence and for that the exact causes responsible are needed to be identified. In this study, the highest adherence with metformin therapy was found in the patients receiving SR formulations compared to those receiving plain or XR formulations. Metformin is associated with some side effects which are lactic acidosis, gastrointestinal (GI) intolerance, Vitamin B12 deficiency, and metallic taste, etc. Approximately, 10%–25% of the patients report these side effects. In our study, 19% of the patients had metformin-related side effects which were nausea, vomiting, diarrhea, abdominal discomfort, abdominal pain, and metallic taste. The most of the side effects were observed with plain formulations (50%). Only few were observed with SR and XR formulations. One study conducted by Blonde et al. for the comparison of GI tolerability of metformin XR with metformin immediate release (IR), concluded that patients switched from IR metformin to metformin-XR experienced fewer GI side effects on comparable doses of the XR metformin. As we have carried out an observational study, GI incompatibility caused by different metformin formulations was not possible to compare. In our study, most of the patients were found obese (48%) and for those patients metformin can be considered as a drug of choice for managing T2DM. As it is an observational study, the probable weight loss achieved after the metformin therapy could not be measured and evaluated. The mean cost of all metformin tablets was found to be 4.97 rupees/tablet in our hospital setting. We also did another cost analysis of different brands which were prescribed most commonly in this study population and concluded that the cost of metformin brand does not significantly affect the medication adherence. In nutshell, we have observed that metformin is frequently prescribed in combinations with other antidiabetic agents. The practice of metformin monotherapy is limited. The commonly prescribed daily dose of metformin in our study setting was 1000 mg. We have also observed an almost equal utilization of different oral formulations of metformin. In our study setting, the most frequently prescribed dual-drug combination was glimepiride + metformin, and the most common drug class combined with metformin was SUs. In adjuvant therapy with metformin, insulin was most commonly prescribed as an antidiabetic agent. Among the different types of formulations of metformin, SR formulation was having high rate of adherence as well as less occurrence of side effects. Further research is required to identify the possible factors responsible for low adherence in different types of metformin formulations. This study also triggers the need of the continuous glycemic monitoring in patients receiving different type of metformin formulations followed by the comparison of the outcome. In our study, we could not correlate the glycemic control achieved by different metformin formulations, as in many of the cases, metformin has been prescribed with other OHAs in combination or concomitantly. Thus, the glycemic control achieved solely by metformin in any specific formulation was not possible to be attributed. As this is just an observational study, the ADR pattern with different metformin formulations was not identified. As this study was carried out in medicine unit of tertiary care hospital, the metformin brands and study population considered were quite limited. Howlett HC, Bailey CJ. A risk-benefit assessment of metformin in type 2 diabetes mellitus. Drug Saf 1999;20:489-503. Vigneri R, Goldfine ID. Role of metformin in treatment of diabetes mellitus. Diabetes Care 1987;10:118-22. American Diabetes Association. Standards of Medical care in Diabetes - 2018. The Journal of Clinical and Applied Research and Education: Diabetes Care 2018;41(Supplement 1):S1-155. Langer R. New methods of drug delivery. Science 1990;249:1527-33. Nasri H, Rafieian-Kopaei M. Metformin: Current knowledge. J Res Med Sci 2014;19:658. Ballard BE. An overview of prolonged action drug dosage forms. In: Robinson JR, editor. Sustained and controlled release drug delivery systems, Marcel Dekker Inc., New York; 1978. p. 1-69. Lakhani OJ, Lakhani JD. Sulfonylureas: Asset or liability? Indian J Endocrinol Metab 2015;19:532-3. Patel B, Oza B, Patel KP, Malhotra SD, Patel VJ. Pattern of antidiabetic drugs use in type-2 diabetic patients in a medicine outpatient clinic of a tertiary care teaching hospital. Int J Basic Clin Pharmacol 2017;2:485-91. Lalau JD, Vermersch A, Hary L, Andrejak M, Isnard F, Quichaud J, et al. Type 2 diabetes in the elderly: An assessment of metformin (metformin in the elderly). Int J Clin Pharmacol Ther Toxicol 1990;28:329-32. Epstein M, Sowers JR. Diabetes mellitus and hypertension. Hypertension 1992;19:403-18. Teja U, Denny A, Kishore Kumar MG, Alyan N, Mahesh NM, Chaluvaraj TS, et al. Utilization pattern and medication adherence of oral anti-diabetic medications among type 2 diabetes mellitus patients in rural areas of Karnataka, South India. J Biomed Pharm Res 2017;6:50-60. Brahmbhatt SV, Sattigeri BM, Nil AK, Parikh DP, Shah HS. A prospective study on drug utilization pattern & rationality in treatment of type II diabetes mellitus: A population based analysis. Int J Res Med Sci 2017;2:983-7. Sultana G, Kapur P, Aqil M, Alam MS, Pillai KK. Drug utilization of oral hypoglycemic agents in a university teaching hospital in India. J Clin Pharm Ther 2010;35:267-77. Powers AC. Diabetes mellitus. In: Kasper DL, Braunwald E, Fauci AS, Hauser SL, Lango DL, Jameson JL, editors. Harrison's Principles of Internal Medicine. 16th ed. New york: McGraw-Hill; 2005. p. 2152-80. Blonde L, Dailey GE, Jabbour SA, Reasner CA, Mills DJ. Gastrointestinal tolerability of extended-release metformin tablets compared to immediate-release metformin tablets: Results of a retrospective cohort study. Curr Med Res Opin 2004;20:565-72.